At work, we have been putting together a continuous integration environment for all of our software projects. Using Cruise Control, we compile, run JUnit tests, and generate reports like JavaDoc and code coverage, for each of the projects. The build is kicked off every time any file in any of the projects changes. The result has been that an email is sent out to each developer every time a build occurs to indicate whether or not the build was successful. If the a build fails, then we try to find out why, and fix the problem as soon as possible. 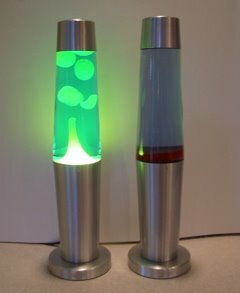 Inspired by this Pragmatic Automation web page, and to raise awareness of the importance of keeping the builds successful, and also just to add a little fun into our jobs, we have tied the success of the builds to the operation of some lava lamps. We have a red lava lamp that turns on whenever any project fails to build. When all the builds are passing, the green lava lamp turns on. This little system was built with about $50 worth of X10 components and two $9.99 lava lamps that we got from Aahs on Wilshire Blvd. Next, we are looking into buying an electric marquee that would scroll the name of any developer who breaks the build.